Tender, full-flavoured thin-cut steaks served with a tangy sauce are perfect for easy entertaining or as a midweek supper. Reserve a few leaves of roquette for garnishing. Place the rest with the horseradish sauce, garlic, mustard and crème fraîche in a food processor (or use an electric hand blender) and blend to a bright green, smooth sauce. Place in a small saucepan. Heat 1 tbsp oil in a large, heavy-based frying pan until very hot then add 3 of the steaks. Cook for 2-3 minutes, turning once. Remove the steaks, place on a plate, and cover with foil to keep warm. Repeat with the remaining oil and 3 remaining steaks. While the steaks are cooking, grill the tomatoes under a hot grill (or cook in the remaining meat juices in the griddle pan when the steaks have finished cooking), until they are just beginning to soften. Heat the sauce over a medium heat for 2-3 minutes, stirring occasionally until it is piping hot. 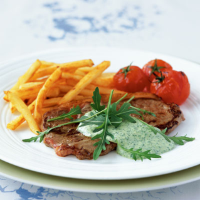 Spoon the warm sauce over the steaks and garnish with the reserved roquette. Serve with Waitrose American Coated Oven Chips (from the freezer cabinet) and the grilled tomatoes. The two extra steaks can be covered and frozen for up to 3 months.